Three men accused of murdering a Matalan shop manager have been found guilty of conspiracy to rob. Jamal Chambers, 18, Roy Williams, 31, and Duane Owusu, 20, all from London, were unanimously found guilty on the conspiracy to rob charge. The three men, along with four others on trial at the Old Bailey all deny murder. 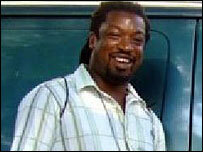 Jamie Simpson, 33, from Derby, was stabbed when he was cashing up at a Matalan store in Hackney in March 2008. The jury has continued to deliberate on the murder allegations. Mr Simpson is alleged to have died at the hands of robbers who intended to steal as much as £30,000 in takings but who had to flee empty-handed. Simeon Jumah, 25, Jammal Chambers, 18, Roy Williams, 31, Kobina Essel, 18, Anthony Maina, 20, Duane Owusu, 20, and a 17-year-old who cannot be named, all deny murder. Maina, from Canning Town, east London; Essel, from east London; Jumah from Manor Park, east London; and the 17-year-old have all admitted conspiracy to rob. Chambers, from Poplar, east London; Williams, from Edmonton, north London; and Owusu, from Manor Park, had denied the charge of conspiracy to rob.